It’s been that time of year again, when we pore over the New Year's’ Honours list to see who has been awarded what, and whether we agree! “Honours” are used to recognise merit in terms of achievement and service, and in this year’s list 1,196 people were awarded honours. Their areas of involvement and stages in life vary greatly, but all have done something to make them stand out from the crowd. We are particularly interested in the last few people on the list as they are less well-known names but have all become successful in the business world in different ways. Most are entrepreneurs - which means that most have been at whatever stage your business is at today! Whether you are currently consolidating your business or seeking small business funding to expand your business further, they have been through that same process. We will feature some of these people in future blogs to see what lessons can be learned from them and their business journey. We are also pleased to see so many women on the above list. 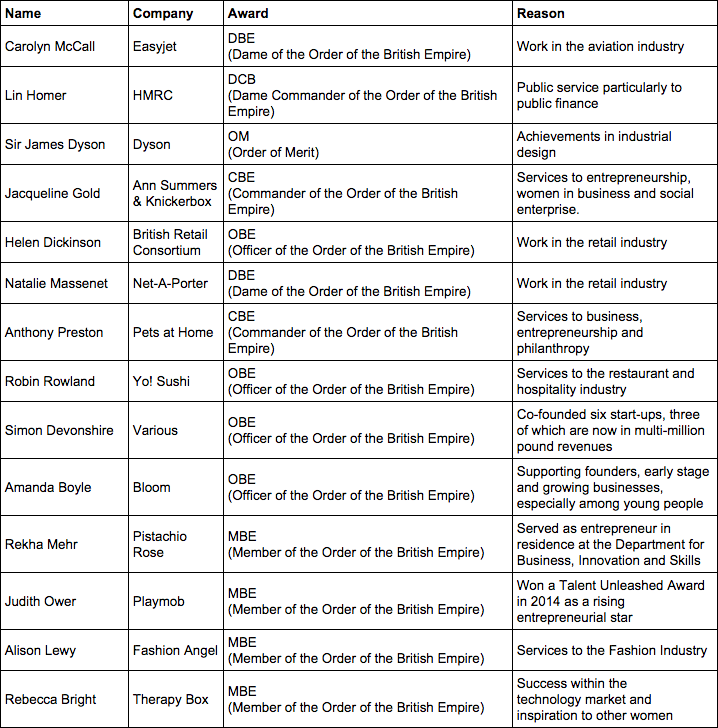 Of the overall 1,196 people on the Honours list, 578 are women, representing 48% of the total. However, there is less representation from ethnic minority backgrounds - 5.7% - and only 7.5% of the successful candidates consider themselves to have a disability under the Equality Act 2010. However, whilst there is still some way to go in some areas, overall we believe that these figures are an encouragement in that Honours are becoming more representative of the business population as a whole. We look forward to seeing the composition of next year’s list! As you start this new year in your business, who knows where things could take you! With a combination of passion, hard work, and wise decision-making you could end up being on the New Year’s Honours list yourself one day! In which case do give our Fair Business Loans blog your first exclusive interview! All of us at Fair Business Loans wish you and your business a happy - and successful - 2016.